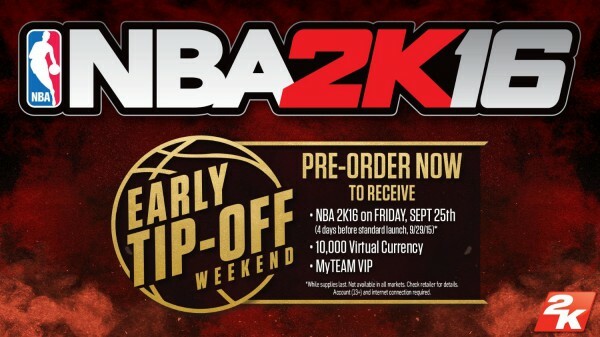 2K games has announced the NBA 2K16 Early Tip-off Edition for North America, which provides pre-order customers with four days of early access to the game. Those who pre-order the basketball title are upgraded to this edition, which also comes with 10,000 in NBA Virtual Currency plus the NBA 2K MyTeam VIP Pack which contains three MyTEAM Emerald Packs with a guaranteed Emerald player. It also includes a MyTEAM Gold Booster Pack with guaranteed Gold Player and four additional Gold items. All items will be packed in with the game, and the offer has been extended to all pre-orders on PC, PlayStation 3, PS4, Xbox 360 and Xbox One. NBA 2K16 releases on September 29 and pre-order customers will gain access to the game on September 25. Check with your local retailer or online vendor for availability and more information.